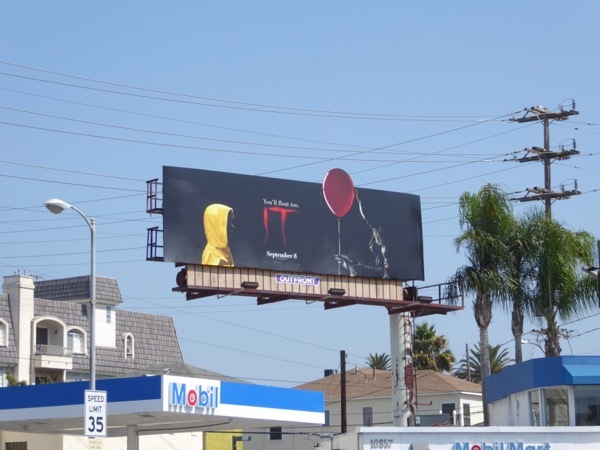 If you need to escape the horror of everyday life at the moment, then Daily Billboard has just the terrifying movie for you with the big screen adaptation of Stephen King's IT. 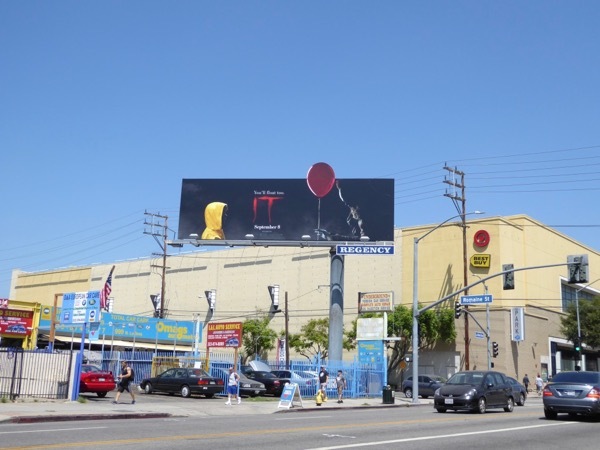 The 1986 horror novel may have already have been brought to the small screen with Tim Curry as the sinister 'Pennywise' clown abducting children and feeding on townsfolk's fears in the 1990 mini-series, but this time around Bill Skarsgård brings an extra level of creepiness to the harlequin-clad, shape-shifting ghoul. The only thing standing in his way of his reign of terror that has spanned generations in the quant small town of Derry, Maine, is a bunch of misfit kids called the 'Losers', a group of children who've been mistreated, bullied or abused, in the street, at school and even in their own homes. With a plucky band of outcasts trying to solve a mystery and save the day, you can certainly see where Stranger Things drew its inspiration from. 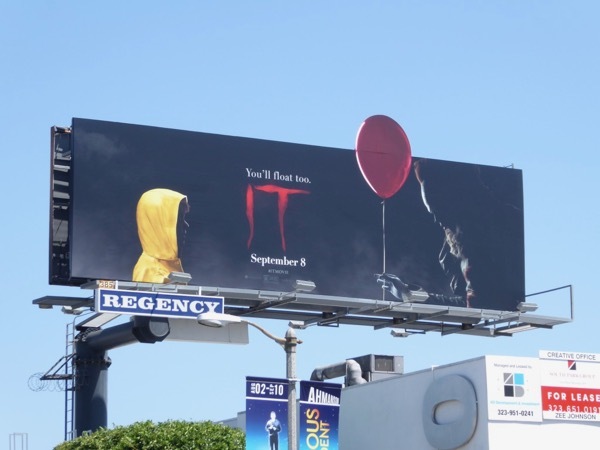 The special extension cut-out billboard for the film was first spotted along Beverly Boulevard on August 11, then above La Brea Avenue and Westwoord Boulevard through August 26, 2017. 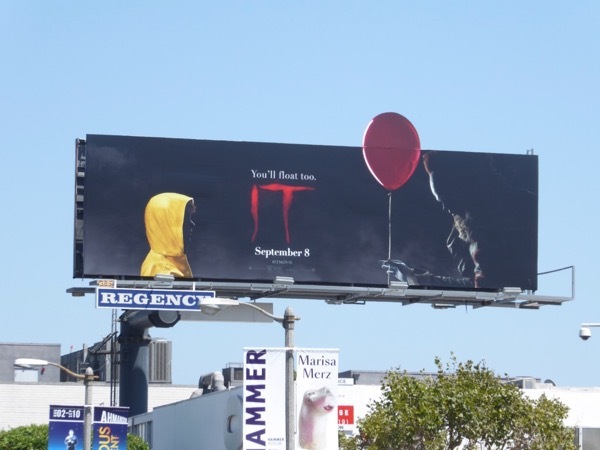 Meanwhile the standard landscape version was spied along Melrose Avenue on August 16 and the portrait billboard as photographed at Warner Bros. Studios in Burbank on August 20, 2017. 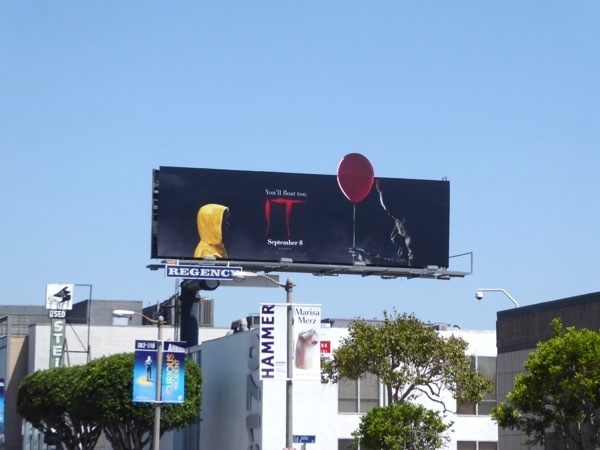 For more (often creepy) clown-themed ad creatives, make sure you also check out these Poltergeist movie remake billboards, these Baskets TV series billboards and these Childrens Hospital TV series billboards. 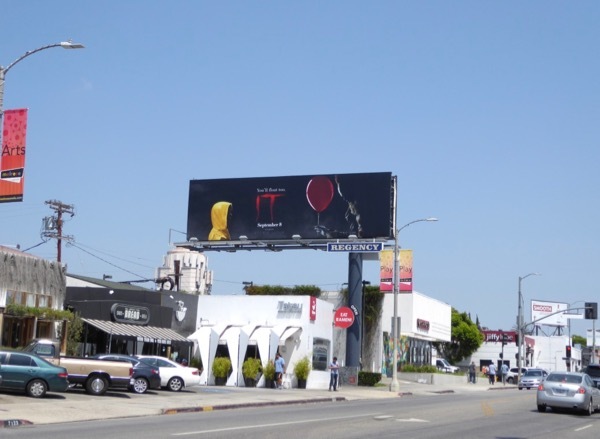 Plus fans of Bill Skarsgård can also enjoy these Hemlock Grove TV series billboards. 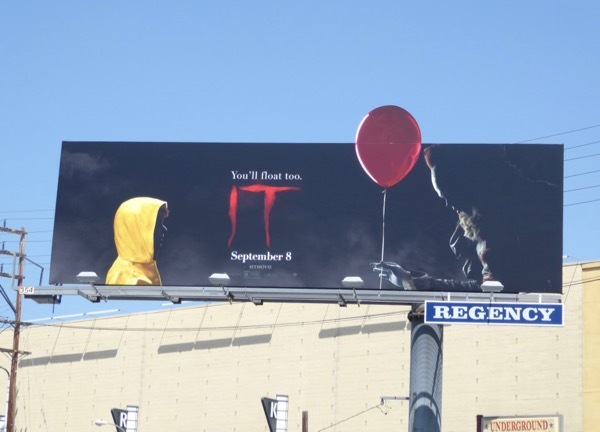 Has there even been a more sinister tagline than 'You'll float too' and such a brilliant visual as a red balloon to convey the idea. 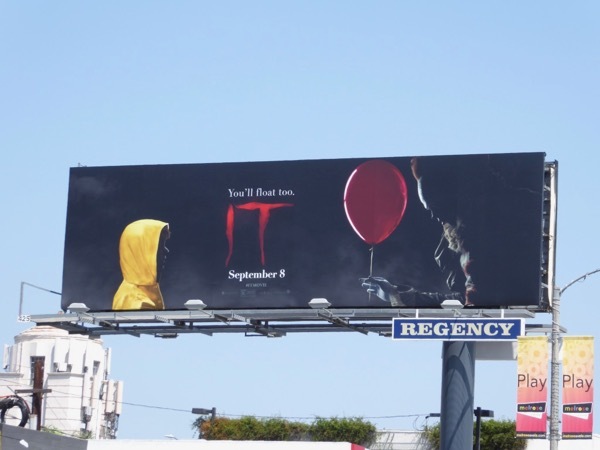 Only time will tell whether IT will sink or swim at the box office, but with these cool billboards promoting the horror movie it's off to a good start. 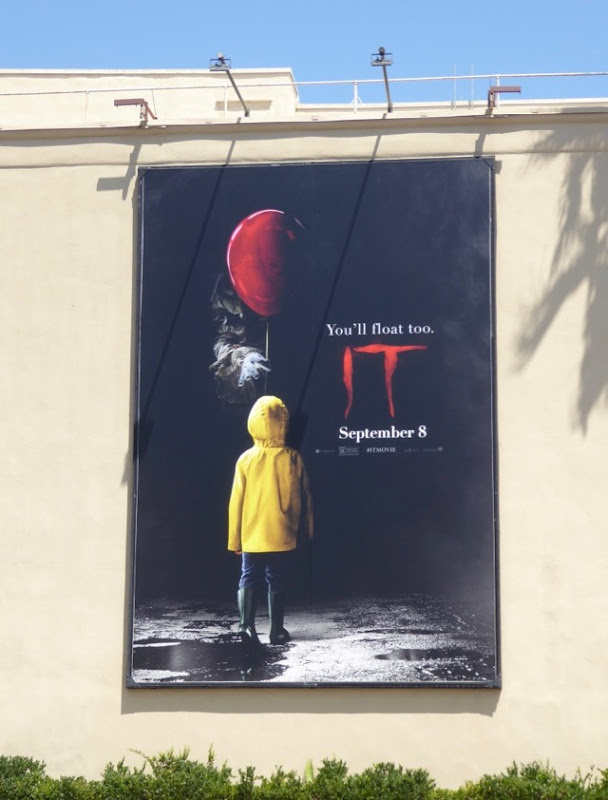 UPDATED: Fans of the film can also check out these screen-used IT movie costumes and props on display, including a closer look at Pennywise's clown costume.